It’s 2am as I settle into the small vestibule – it’s a snug little front area separate to the main part of the tent which offers a view of the beached boat about 100 yards away, through the small air vents. Surrounded by our cooking equipment, dry suits, shot gun and a few other essentials I make myself a hot coffee. Between the coffee, the vestibule and my 5 layers of clothing, it’s not too cold. The 3 lads are in their sleeping bags; I decide to throw on a pot of noodles to accompany the coffee. Frank did the first watch from midnight to 2am so now it’s my turn. We’re on land and have beached the boat. Originally we received a gale warning which was subsequently upgraded to storm force. We’re in the middle of 55 knot winds (about 100km an hour) and gusting higher. We’ve used 3 separate anchor points to secure the boat as best we can. We agree to maintain a watch throughout the night as there is a huge amount of tension on the anchor lines. 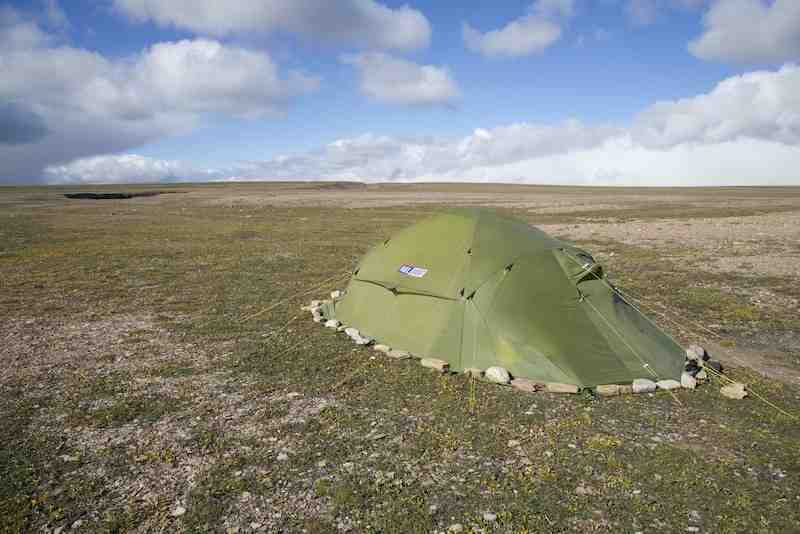 The tent is also under enormous pressure from the power of the ferocious wind. As the Arctic Joule is being slapped about by the thrashing waves, it rocks the anchor points. We’ve used hundreds of pounds of rocks and loose stones (packed into bags) to add more stability but there is still the risk (hopefully a small one) that the lines could snap and the boat gets swept out to sea such is the pressure Mother Nature is exerting on her. So maintaining a watch all night is a must. The order of the watch is decided over a game of hearts. Frank won and opts for the first shift, I was second and so follow him with Kevin next and Denis taking the last shift from 6am to 8am. Personally I believe a certain amount of tension or stress is healthy. I think it enables growth and performance in so many ways. Like exercising for example, pushing the body and putting it under stress when we train. Combine this with adequate rest periods for recovery and the body becomes stronger, fitter and healthier. 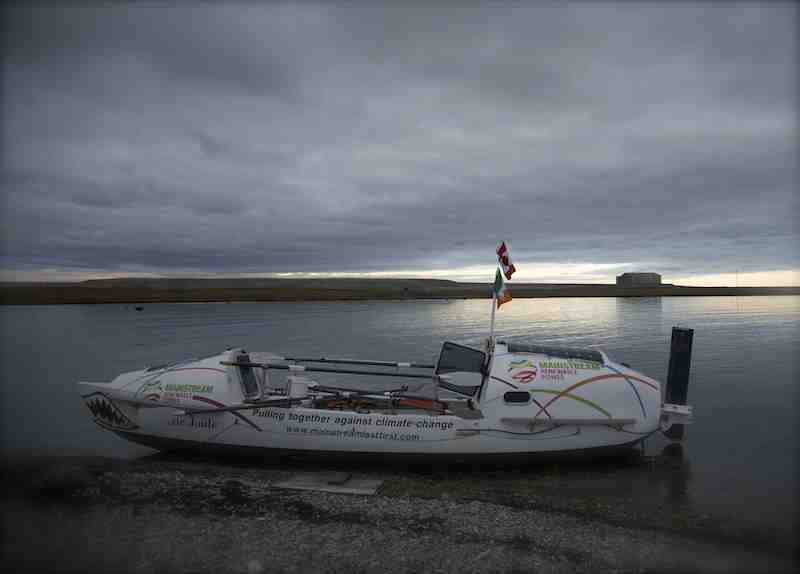 We certainly have plenty of tension in our little world tonight as we watch over the boat while also hoping that the tent poles don’t snap in the stormy winds – no doubt this is serious stuff. Every 5 to 10 minutes, I peer out the vent to make sure the boat is still there. I then go back to my chosen activity to pass the time which tonight is writing. I’m actually really enjoying this time jotting down notes, thoughts, ideas and whatever else comes to mind. At 3am, I go down to the boat to check the lines. 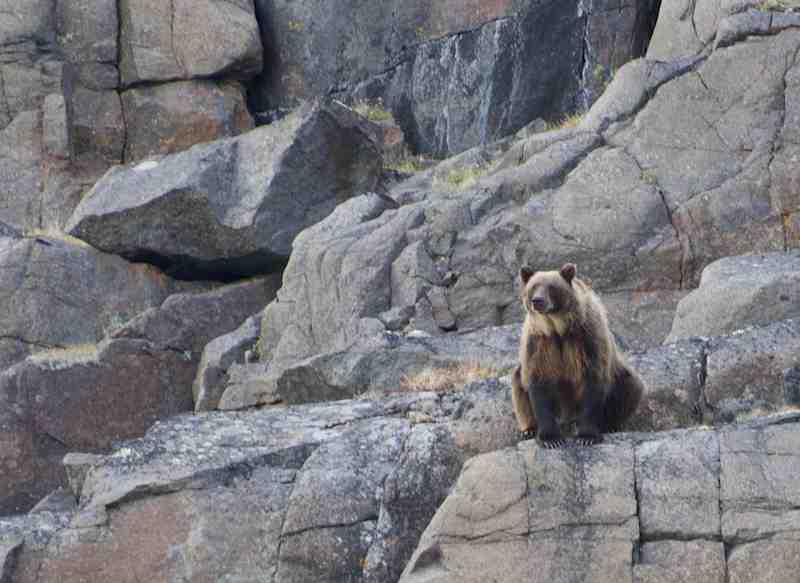 I bring the shot gun with me in case I stumble upon a grizzly – highly unlikely but no harm in being safe. The temperature is below freezing tonight, it’s dark, we’re in the middle of an Arctic Storm, I’m carrying a loaded shot gun for protection and the boat is under serious pressure from Mother Nature. All in all we’re in a very exposed position but yet I find myself actually enjoying this. Am I a bit odd, maybe a touch adventurous or perhaps its just easy to enjoy a situation like this when you feel you have things under control (or at least as much control as is possible in this situation). At 4am I go out again to check the lines before Kevin takes over – all good and secure. I join the lads in the tent and climb into my sleeping bag and quickly nod off to the sound of the howling wind and the flapping of the tent. 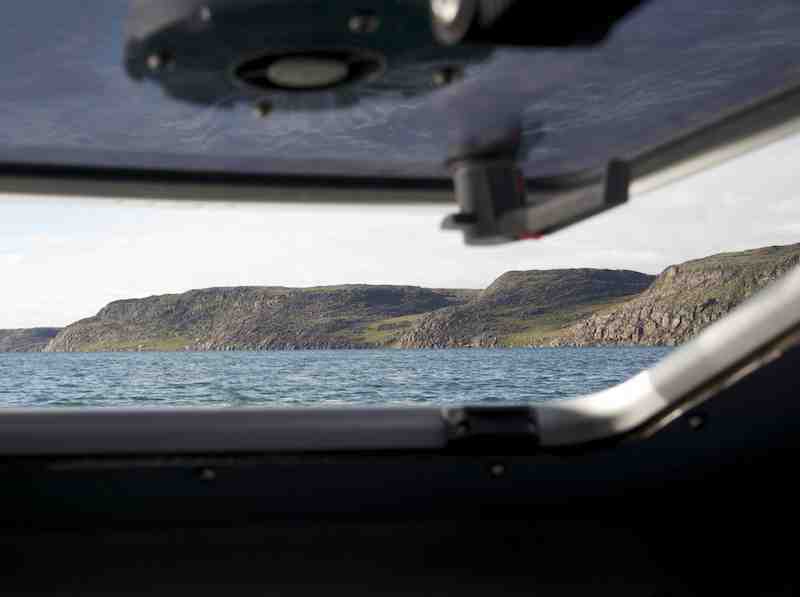 Another interesting day in the Arctic……. The weather has been fairly kind to us today, temperatures have dropped, we’ve had a bit of rain but the winds have been in our favour so we’re all happy to put up with the cold in return for good winds. Today we saw our version of snow white and the seven dwarfs in the form of a Grizzly and a herd of Muskox (7 of them to be exact). 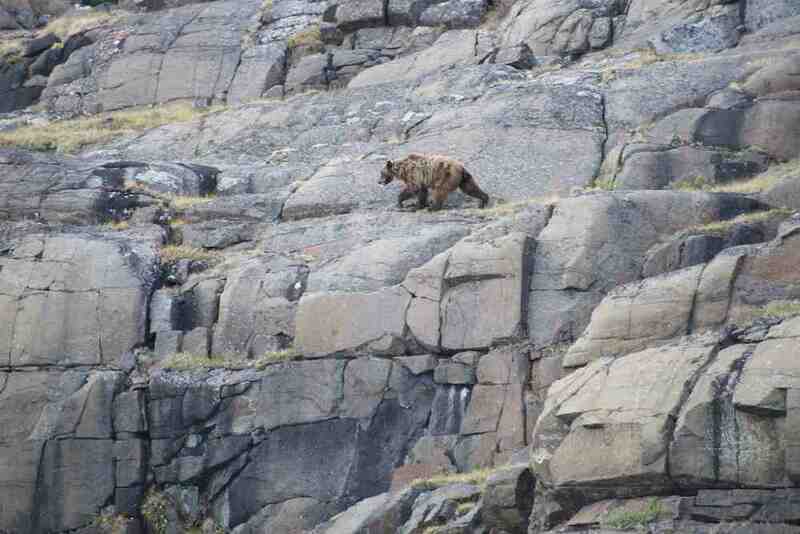 Kevin spotted the grizzly hovering around a steep rocky ridge and we pulled in closer for a better view. I don’t think we were close enough for him to see us clearly (Grizzlies don’t have good vision) but he was definitely aware of us and was trying to get our scent (they have incredible senses of smell). We were downwind of him so I don’t think he could pick us up which is a bit surprising given the fact that we haven’t showered in so long! The past 24 hours have been arguably the most stunning of our trip so far. We rowed though an inside channel between Victoria Island the Edinburgh and Richardson Island Group. 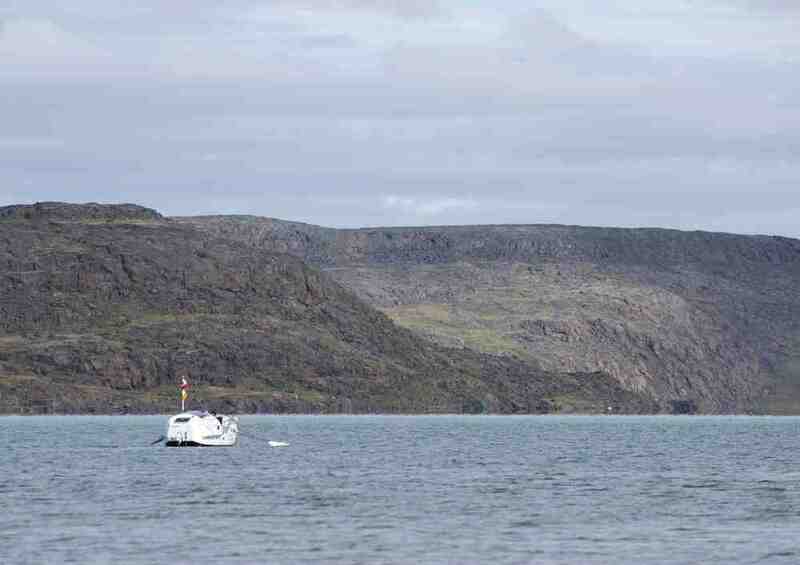 The channel worked its way through an enchanting landscape, a combination of rugged cliffs, soft green patches scattered with rocks and boulders. 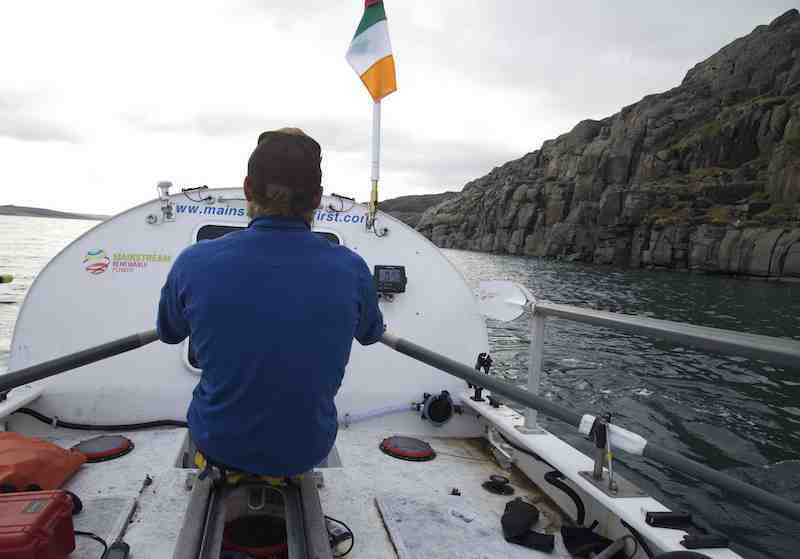 It felt like rowing through a combination of “The gap of Dunloe” and “The Giant’s Causeway” which are two stunningly beautiful parts of Ireland. The Gap of Dunloe in Co Kerry is similar to what I described above while the Giant’s Causeway in Co Antrim is an area of about 40,000 interlocking Basalt columns the result of an ancient volcanic eruption. I believe the basalt was formed from lava which cools and solidifies. This was a lovely treat for us today but as I write this, we have a gale warning for tonight so we’re going to pull into a spot shortly to shelter for the night. The direction of the strong forecasted winds would be pushing us in the wrong direction so we reckon its best to anchor in somewhere out of the way. It’s tempting to keep going as we’re making really great progress but that would be foolish given the forecast we have so we’ll air on the side of caution tonight – only 180km to go to Cambridge Bay…..
Travel has become pleasant for us in recent days. We’re currently sprinting ahead of an incoming gale that promises to hit the region tonight or early tomorrow morning. Our meteorologist is calling for 35KN winds and snow so our intention is to find somewhere suitable to moor and set camp for the night. Our route has taken us through an inland channel between the mainland of Victoria Island and the Edinburgh and Richardson Island group. We’re unsure at first if this inside line is the most advantageous for us and even toy with the idea of heading out around the island group, skipping the passage altogether, but we choose the inside line and are happy for it as it’s the most striking section of route we’ve seen so far. The landscape of Victoria Island we’ve been seeing to this point eases from the water and gently rises to form perfectly uninterrupted ridges that run to the horizon. The surface appears raked with a strong linear texture defining its surface. It appears as an endless series of high tide lines marching upwards and backwards in time. The concept of time is different in the arctic. I heard a story about a traveller discovering whale bones high on the shores of a small island off Svalbard. The bones are fully intact and seemed to speak to a fairly recent passing but the traveller is perplexed because the bones are so far from the water line. How could such a large marine mammal be moved so far up shore so far beyond any possible storm surge? Astonishingly the bones are thousands of years old and simply speak to a different time in a place with a different sense of it. The landscape changes dramatically once we enter the channel. The gentle slopes of green and brown are replaced by craggy walls and precipitous cliff. The rock appears to be different as well looking more like a granite or quartzite pushing up from the earth below, blocky and steep. It’s a stunning backdrop that draws in upon us as the passage narrows. Combs of rock rise out of the water and form islets marching down the channel. They appear like the sweeping backbone of some giant sea creature diving to the depths petrified in the moment. The cloud and drizzle that’s been following us for days begins to thin and streaks of sun begin to wash our world of rock. The wind is calm but the current is strong and we maintain a brisk pace with little effort. The arctic is a shy and retiring companion with a predilection for moodiness and gloom but treated with patience and understanding will eventually share everything it has. It’s doing that now. We see movement on the shore and spy a grizzly bear prowling the bank. I’m amazed at the grace and ease at which it clambers up the cliff as we move in closer. We’re downwind and it can’t make us out but it’s still curious. It bounds upwards a few strides only to stop, turn back and search for the unidentified odour. It’s soon on it’s way and so are we. Our idle time at Cape Lady Franklin cabin has us exploring the decommissioned DEW Line station (something we’ve becoming quite sophisticated at having toured so many on this journey). 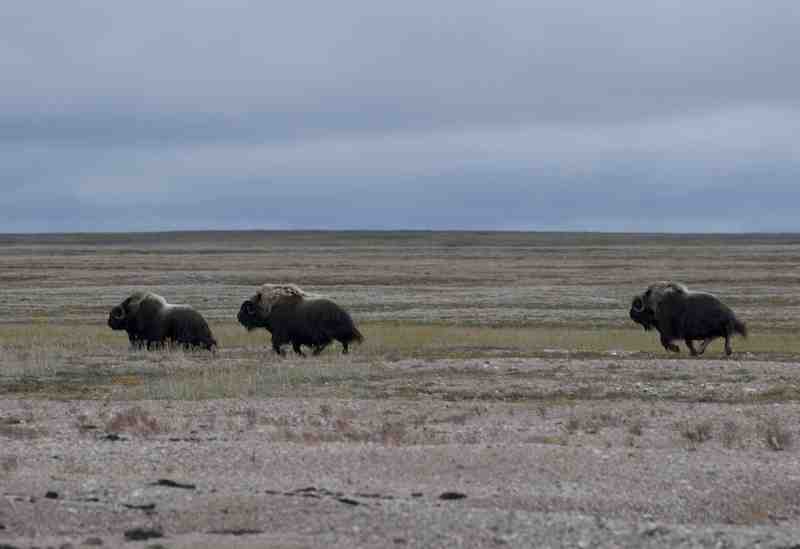 We see three muskox trotting in single file across the horizon, their huge hairy coats draped over four spindly legs that are all but hidden by the mane above. They look more like life size puppets than real animals. We take the time to shoot a few rounds from out shotgun to ensure it’s still firing as our gun cleaning regiment is sadly lacking. Frank finds an old piece of plywood and sets it up as a target. 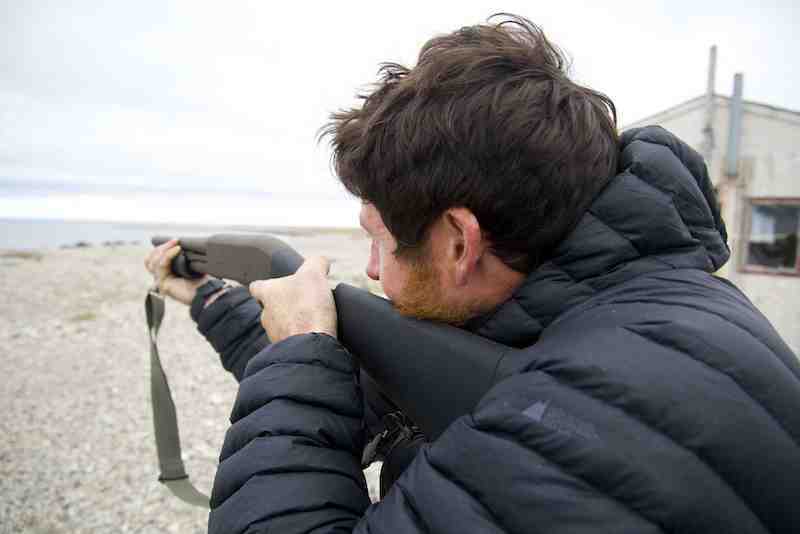 The intensity of a shotgun blast always surprises me, the thump in the crook of my shoulder akin to a hard punch. The plywood gets the worst of it. Frank spots a small dot on the horizon we hadn’t noticed earlier. It’s a long way out, likely 10km or so (far from shotgun slug range) but it’s coming our way. It doesn’t take long for the small black blob to morph into a small sailboat with red sail and two sailors. We know about this boat. It’s been shadowing us for the last two weeks. The boat arrives and out hop two easy going sailors. Matt and Cam are expat Australians living in San Francisco. 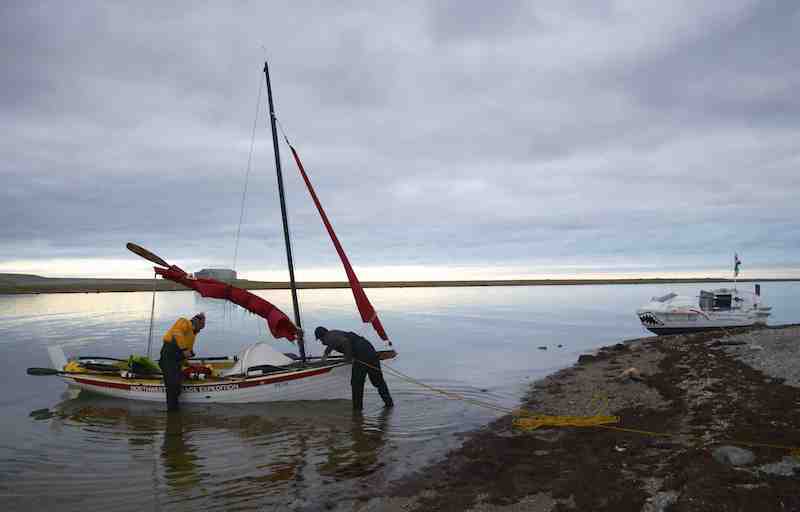 They are attempting to sail and row their 17ft boat from Inuvik to Pond Inlet. “What’s it been like?” I ask Matt. “You guys know! 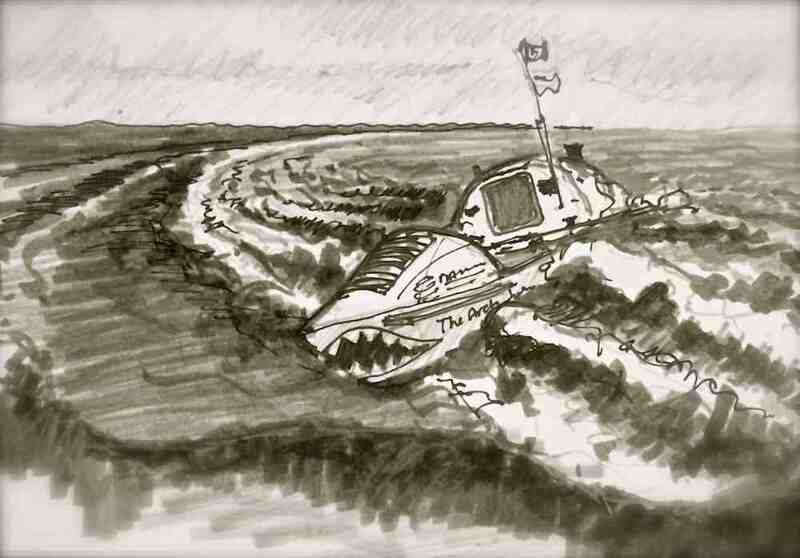 !” he says with a wry small, “It’s been brutal” They’ve been suctioned to a mud flat for the better part of a day, have been overwhelmed by a following sea that nearly saw them swamped, they’ve been encircled by 90% ice, they’ve struggled and endured. They heard about our anchor cutting incident when someone emailed them about the story telling them to turn back to Tuktoyaktuk and to save themselves. We’ve heard through the grapevine that the team of Matt and Cam (Fairmont’s Northwest Passage expedition) were right on our heels. We expected them to come flying by on a number of occasions because of their sail power but the reality of their small boat is that the high winds in these waters play havoc with sail propulsion as well. We’re moving at a similar pace. It’s not long before we’re sharing our stories and laughing at the madness of our adventures, all six of us shoehorned in the Cape Lady Franklin cabin. We learn that Matt and Cam are experienced adventurers having travelled the arctic and antarctic by foot, sailboat and kayak. Matt’s a three-time North Pole skier as well. The evening chat is comfortable and relaxed, a group of like-minded individuals sharing a unique moment, happy to be in each other’s company. It’s a windy morning when we awake but the wind is a favourable Northwesterly and will assist us in our run down the Coronation Gulf. We pack up and head out while Matt and Cam choose a rest day. We’ll be seeing them again no doubt. 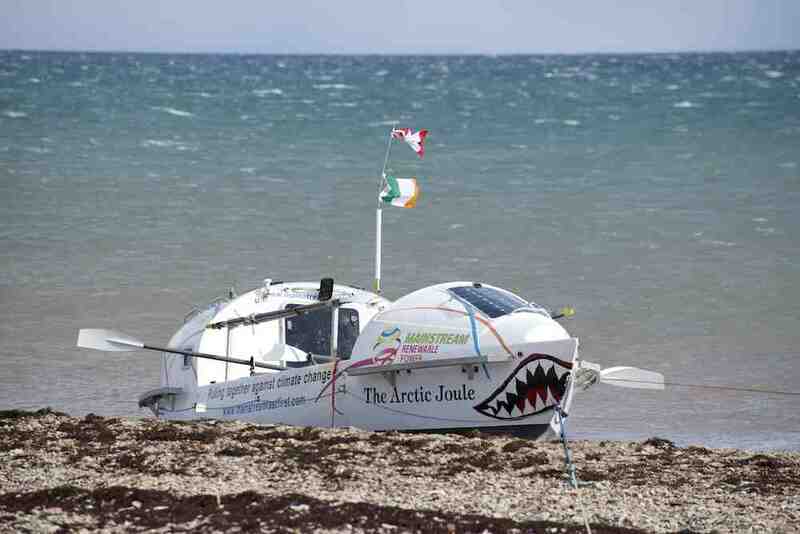 We row out into a 20-25KN wind that has us flying down the coast. It’s a bumpy ride as the Northwesterly keeps pushing us away from shore but by days end we clock in an impressive, but hard fought, 72km. You take what you can get up here.